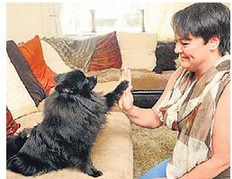 Can you ever believe that a dog ( named Princess), four-year-old can hypnotize? Such is the claim of friends of Krystyna Lennon of Leeds in Britain. She is busy to arrange shows all over the UK. The dog is German Spitz. The Owner holds the dog in the lap cuddling her and call spectators one by one for the trance. In less than ten seconds attention of the dog’s, the caller falls to sleep. It is debatable whether the dog is real or fake. The experts believe it is Kristina herself who is the hypnotist. It is a stage hypnotist with a gimmick; just the usual highly responsive few plucked from the audience responding to her suggestions, nothing to do with the dog. Another one from the audience means to say such a dog is in demand so that with little more training, it will walk any burglar to the police station. Lenon claims that the dogs have the primal ability to hypnotize its prey. Others say that it is only a puppet, or it is not even a dog. However, she can sell herself efficiently and has seasons booked in advance. The educational institutes and Universities are the primary customers for the show. Friends of Kristina say that whenever they meet the Princess they find their behavior changed. The change is due to hypnotizing effect of the dog. Kristina, a professional hypnotist, had noticed Princess’ capability of hypnotizing. Not only citizens of Leeds but also people from other cities have come to the show. Princess is well known in the social media. Dog Psychologist Stan Rawlinson says that anybody friendly with Princess can hypnotize others by calling the dog. Kristina is the niece of famous Hugh Lennon a show Organiser (business professional.) He started the first “Hypno-dog Show” in 1989. Kristina was young then and assisted him in the show. Right now, Kristina is on a tour in the UK and would conduct shows in Dubai and Australia in 2015.